Smart and promising medical student Kang Ma-Roo (Song Joong-Ki) has been in love all his life with his slightly older neighbour Han Jae-Hee (Park Si-Yeon), a television reporter. He is an adoring boyfriend and she always considered Ma-roo her home. But when her situation takes a turn for the worse and Jae-Hee becomes desperate to escape poverty, she meets a man who changes everything—a rich CEO who introduces her to a life of comfort. So she turns her back on Ma-Roo, choosing money over love. The brutal betrayal leaves Ma-Roo fractured—not just angry, but a completely changed man. A few years later, Ma-Roo is now 30 years old and works as a bartender and gigolo, no longer a “nice guy.” He then meets Seo Eun-Gi (Moon Chae-Won), a young chaebol heiress who’s being groomed to take over her father’s conglomerate. Eun-Gi is cold and calculating, business-savvy, and raised by her father to never show emotion to anyone. But Ma-Roo intrigues her, and she becomes curious until she can’t stop thinking about him. Ma-Roo decides to take advantage of her as a pawn in his plans for revenge, and Eun-Gi falls in love with him, not knowing that he’s using her to get back at his ex Jae-Hee, who happens to be Eun-Gi’s young, gold-digging stepmother. Just when Ma-Roo is beginning to genuinely care for Eun-Gi, she finds out the truth and they break up. But a car accident causes Eun-Gi to lose her memory, and she enters Ma-Roo’s life again. After watching Descendants of the Sun (2016), my best friend suggested me to watch another drama of Song Joong-Ki. At first episode, I don’t find The Innocent Man enthusiastic. I even found it boring at some point. But still, I tried to hold on and continue watching it. And I don’t regret my decision to keep watching and I even manage to finish this Korean Drama in just two days! The same time period like when I finished Descendants of the Sun. My holidays are really well spent for Joong-Ki. The story is actually pretty good and interesting. The basic idea is pretty simple, but they managed to execute the story really well. Therefore, this drama is pretty good actually. Speaking of the actors and actresses, I don’t really like the main female characters at first, especially the protagonist, Moon Chae-Won who played Seo Eun-Gi. But as the story goes by, she’s not pretty bad. Moon Chae-Won has portrayed her character really well. Her emotions were well put and her acting is also really great. Park Si-Yeon is pretty good too. The last time I watched her drama is when I watched My Girl (2015) where she also played the role of an antagonist. In that Korean drama, she also made the audiences pissed. Well, if you can feel annoyed with the character, that means the actress or actor did a good job, right? That’s what I felt when seeing the character of Han Jae-Hee played by Park Si-Yeon. Although I don’t like Park Si-Yeon, I think she’s good in playing antagonist character. As for Joong-Ki, please don’t ask me. I will start babbling again about how good and handsome he is. Although to be honest, he did look more handsome in Descendants of the Sun. In that phenomenal Korean drama, Joong-Ki was just unbeatable. At first few episodes in The Innocent Man, Joong-Ki didn’t look too attractive though I must admit the way he portrayed his character is perfect. I can’t believe he managed to look so different compared to when he played Descendants of the Sun later on. 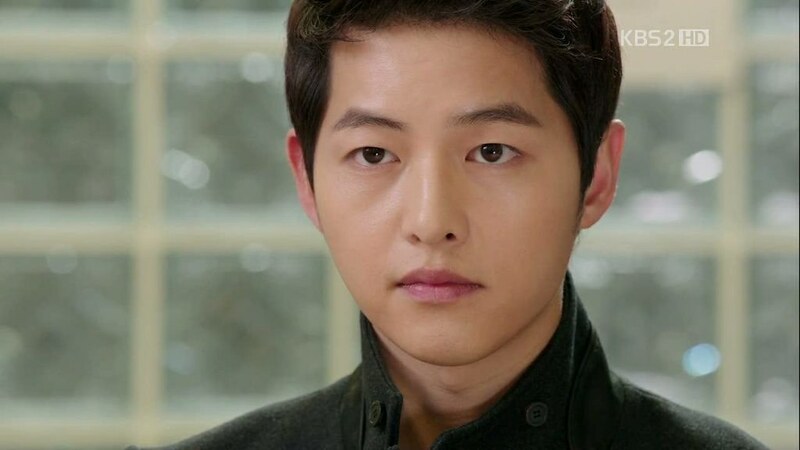 After several episodes, Joong-Ki grew not only more mature but also even more handsome and cooler than before. Perhaps not as in Descendants of the Sun, but still, I really like him a lot! Song Joong-Ki has proved us he could play any character. His character in this Korean drama is different from Descendants of the Sun, yet he still did a great job in portraying the character. There aren’t many actions scene here but the story itself is already intriguing. Pretty much very exciting at some points. Song Joong-Ki really can show his emotions really, whether he’s sad or angry or happy. You can see and feel it very clearly. I also like the chemistry between Song Joong-Ki and Moon Chae-Won. How they interact with each other is so good that they really make a good couple. Song Joong-Ki as Kang Ma-Roo has really shown us how much he cares about Seo Eun-Gi, portrayed by Moon Chae-Won. It’s not as sweet or as heroic as Descendants of the Sun, still, Kang Ma-Roo and Seo Eun-Gi have their sweet moments as well. I really like how both of them show their feelings and emotions, and finally made the audience felt their feelings and emotions too. Moon Chae-Won played her character really well. From a serious and stubborn woman to a childish woman who has lost her memories, she played the character really great. I’ve seen Lee Kwang-Soo in a reality show called Running Man. He is so funny on the show and still looks funny in this Korean drama too. I heard from my sister that he used to be a model so I don’t know about his acting. However, in The Innocent Man, Lee Kwang-Soo proved his acting skill is also very good. He is funny and his chemistry with Song Joong-Ki’s character is also really great. In real life, he and Song Joong-Ki is actually best friends, so I think it’s not hard to act as best friends in this series too. Kwang-Soo has portrayed his character really well. Even though his character is just a side-kick character, Lee Kwang-Soo is someone who deserved to be reckoned. Although the story is not that bad, I kind of disappointed with the ending. Like very disappointed. The ending is just too fast! I mean, I get what happened to them, but there are some things left untold. I won’t tell you what, but you’ll know if you watched it. This unfinished—to me it’s unfinished—ending has made me keep thinking about it every day ever since I have finished watching it, literally. I think they have to add at least one more episode to finish the overall problem. I don’t think it’s going to hurt to add one episode, right? But well, the drama has long passed, therefore, I can’t do anything about it. Despite the slow beginning and exciting middle story, the ending is pretty disappointing and too fast. It’s like we have to accept the ending of The Innocent Man only 5 minutes before the series is over. It did make me feel irritated, you know. The basic idea or the general idea of The Innocent Man is actually pretty strong and exciting, but truly, the ending is too disappointing. Despite the disappointing ending, the overall story is rather good. I think Joong-Ki took most of the really why I give this Korean such high marks. His acting is superb. Not that the others are not, but I really think Joong-Ki’s acting is superb. Yep, I am totally in love with him. I give The Innocent Man 8 out of 10 stars.